In recent years it seems that the Ameco AC-1 Novice transmitter has developed quite a cult following -- a following that it never really had when it was still in production. Ameco's $14.95 (in kit form) transmitter now sells for hundreds of dollars on EBay. 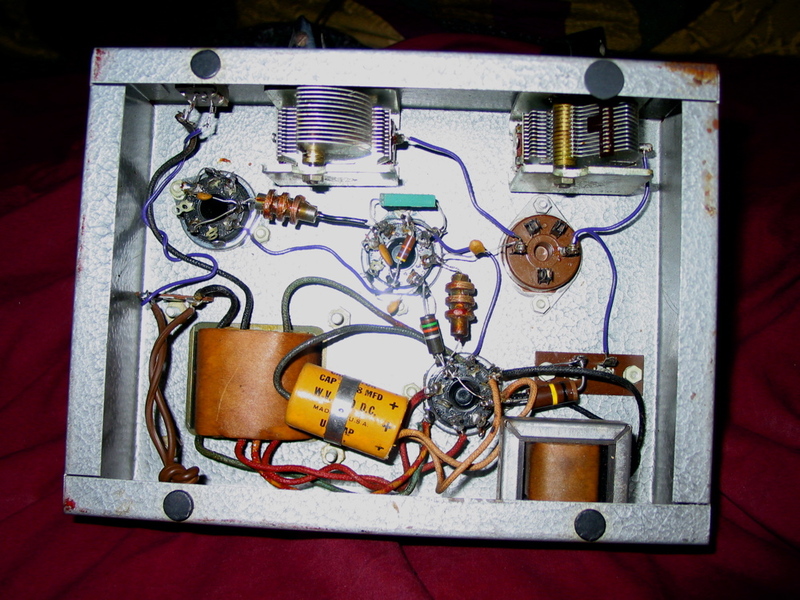 There are entire web sites devoted to the rig, a number of people have built replicas, and there is a QRP club in Houston that is in the process of once again offering a complete kit of parts to build a reproduction. It seems that some people simply cannot get enough of the things. In order to help fill that void, I offer my Ameco AC-1 story to the world. Above is a snapshot of my AC-1. On a scale of 1 to 10, I rate this unit to be about an 7.5. It has a few very small rust spots, a tiny unoriginal hole in the middle of the left and right sides and some scratches on the beautiful gray hammertone finish. Although I have never put this unit on the air, it seems to work properly. Keying can be a little bit chirpy, depending on the band and crystal. The thing even makes enough RF to visibly light the filament of a 60-watt light bulb dummy load. Mind you, it is hardly enough light to read by, but I think that the allure of the AC-1 has always been more about what one might be able to do with it, rather than what it actually delivers. Yeah, I know I am probably about to hear from hundreds of people out there who earned their WAS with an AC-1 and a beat up old Hallicrafters S-38 back in 1963, but I think the reality is a little bit different. Today, the AC-1 is a very usable QRP transmitter. Back when you could actually buy one brand new, they were made only for the most determined and poverty stricken of budding hams. Just my humble opinion. During my novice days of the late 1960's, I was never really interested in the AC-1. 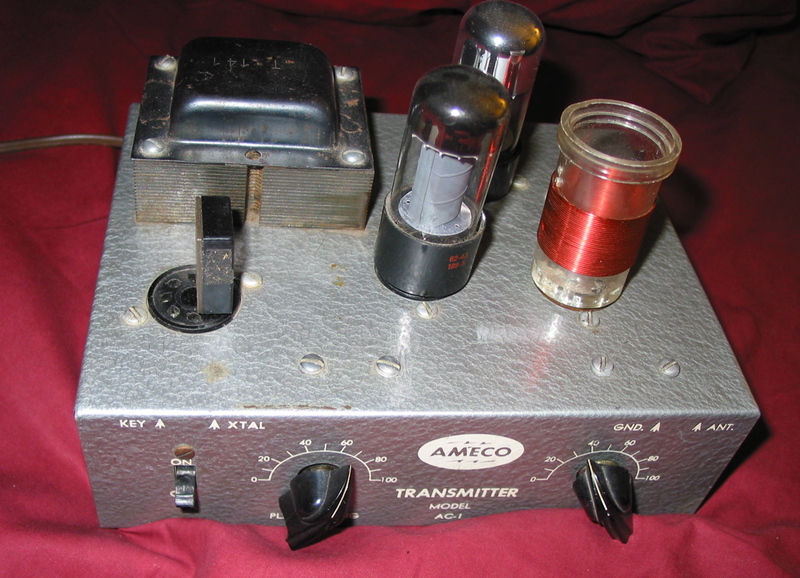 Instead, the Ameco transmitter that I coveted was the TX-62, a nicely built AM VHF transmitter that put out what was then a respectable amount of power (about 15 watts of AM, I believe) with very good audio quality. TX-62's and their matching VFO's were extremely popular in the days just before FM changed 2 meters forever. At least they were popular on the airwaves of Northern New Jersey. Unfortunately, they were priced well beyond the range of my high school allowance. Ironically, these days they can barely give TX-62's away on EBay. Who would have thought that it's ugly step-sister, the AC-1 would become such a hot item? By the way, my 2 meter novice transmitter was a Heathkit Twoer. Heath promised that the transmitter final amplifier drew every bit of 5 watts. It sort of did a respectable job lighting a #47 pilot light bulb. Not that long ago I tried measuring the output of a Twoer on a Bird model 43 with a 10 watt slug. I think it put out a bit more than hundred milliwatts. It is a wonder that I ever worked anyone with the thing. In that regard, I suppose it was the VHF equivelent to the AC-1. Little did I know. In my novice days I never knew anyone who owned a AC-1. A friend of a friend of mine reportedly had one, but I never met the guy. I don't recall ever working someone using one on the air. When I would look through photos of novice stations in Popular Electronics I never saw an AC-1. There were lots of DX-20's, 40's and 60's, Johnson Rangers and Adventurers, Knight T-60's, just about everything else, but never do I recall seeing the poor little Ameco AC-1. Which, could have something to do with why they are so hard to find today. My Ameco AC-1 found me in the flea market at the 2001 Dayton Hamvention. The market had been open for several hours. Cash was in very short supply for me that year. I had only allocated $100 for all my flea marketing purchases. Somewhere in the middle of the fleamarket I spotted a strange looking black bakelite box with a very broken old Shurite moving vane meter mounted in the middle of it. I picked it up, and realized that it was someone's mad idea of a souped up AC-1! Someone built a box around the top of the AC-1 in order to make it look fancy. They installed a crystal selector switch and a meter. Fortunately, they figured out how to do all of these modifications by only drilling an 1/8" hole in the middle of the left and right sides to hold the case in place. I don't know whether or not the rig worked, and I was not about to plug it in to find out. Who ever made all of the "improvements" wired the entire unit in #24 magnet wire. They also left all of the component leads their orginal length. Still, underneath a couple of decades of dust I could see a very restorable Ameco AC-1. I gave the seller his asking price, which was no more than $25. I felt a pang of guilt over getting such a good deal, but the guilt quickly subsided. I really enjoyed the time that I spent cleaning up and rewiring my AC-1. As you can see, it turned out very well. It was almost as much fun as building it from a fresh kit of parts. Earlier I mentioned that I have not put this rig on the air. Although I love collecting and restoring vintage ham gear, I spend very little time operating. I just do not have much time for it. An AC-1 QSO is still on my "to do" list. Who knows? Someday you may be the person I contact.